Cut the beetroots from the stalks and the stalks from the leaves and wash them all thoroughly under running water. Soak the leaves in a large bowlful of cold water for a few minutes so any trapped silt sinks to the bottom. Meanwhile, preheat the oven to Gas 200ºc and peel and dice the beetroot into approximately 1.5cm by 1.5cm cubes. Toss these with the olive oil and balsamic vinegar, some finely chopped rosemary, and salt & pepper. Line a roasting tray with grease-proof paper, and cook in the preheated oven for 28 minutes. 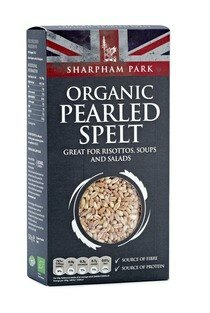 Rinse the spelt, and cover with cold water in a medium saucepan, add a generous amount of salt to the water, and bring this to a gentle simmer. Cook the spelt for approximately 24 minutes. This should dovetail nicely with the roasting beetroot. Meanwhile, prepare the pickled stalks which will add a great bite to the dish, both in terms of texture and flavour. Combine the liquor for the stalks by combining all of the ingredients and bringing the liquid to the boil. Finely slice the beetroot stalks and place in a small mixing bowl or container with a lid. When the pickling liquor has boiled for two minutes and all the sugar has dissolved, pour this over the stalks. These will keep happily in the fridge for up to 2 weeks, garnishing other salads, or pairing with cheeses nicely. All that remains to do is to crumble the goats' cheese and toast the walnuts in the oven - about 4 minutes should be sufficient to boost their flavour. An optional step here - but well worth doing! 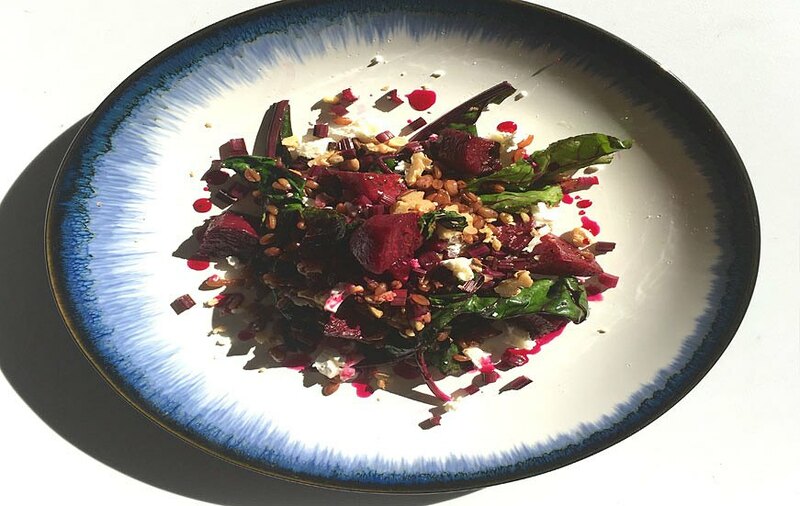 - is to reduce some of the pickling liquor (which is now infused with beetroot flavour and colour) as a delicious, not to mention beautiful, dressing to drizzle over the finished plates. Simply strain half the liquor back into its small saucepan and boil rapidly until slightly reduced and looking syrupy. Drain the spelt and allow the steam to billow off; there's no need to wash the saucepan, a quick rinse will do, as we can use it straight away to sauté the beetroot leaves. Heat a tablespoon of olive oil in the saucepan and add the beetroot leaves, tearing any which are fairly large, and perhaps discarding the toughest few. Pop the lid on and sauté/steam these for 3-4 minutes. Add in the cooked spelt, and then the roasted beetroot. Stir well and season lightly with salt and pepper. Tip into warm bowls and scatter with the crumbled goats' cheese and the roasted walnuts. Spoon over some pickled beetroot stalks too, and a tablespoon or two of the pickled beetroot reduction.